Because we care about you, the RV owner, the RV Doctor offers five-year warranty plans on parts and labour. Did you know, on average, most RV owners only own their particular RV model for just five years? It’s true. A majority of RV owners trade in their RVs due to issues related to water leakage, propane appliance issues, structural problems, as well as many other issues that can be costly to repair. This five-year span is also the reason we include five long heart beats in our logo — we’re always looking to extend the amount of time you own and love your RV. Most customers are unable to get service right away from their RV dealer, typically because their warranty runs out by the time issues start popping up. Most RV dealers are busy serving units sold within the past year and will only touch older recreational if and when they have the time. We’re there for you! That is why our logo has a heart where the ‘O’ should be. We are a company that truly cares about you, the RV owner. 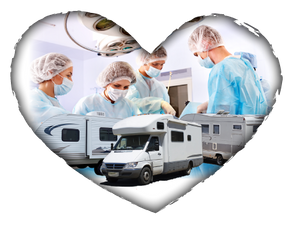 To serve you better, RV Doctor is available 24 hours a day, 365 days a year. Did you catch us at the “People in Motion” exhibition in Southern Ontario’s Queen Elizabeth Exhibit Hall? We’d like to thank you for stopping by, asking questions about our services and helping to make the event a huge success!